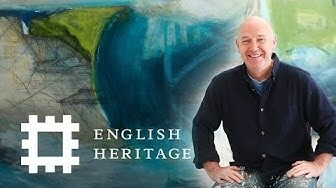 David was commissioned by English Heritage to paint a picture for their 2019/20 handbook front cover and membership card. Selected from 28 artists to produce a painting in response to Tintagel Castle on the north Cornish coast, David visited Tintagel in September 2018 and set about making preliminary sketches which led to several larger studies - one of which was chosen by English Heritage. The final painting, 'Passage' was completed a few months later.